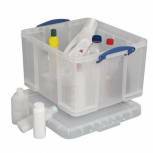 Really Useful Clear 84 litre Plastic Storage Box 84LC Pack of 1 Really Useful Office Box. Versatile, transparent storage box designed for office use. 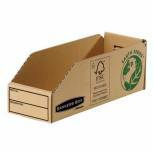 Features include an integral lip to accommodate suspension files, locking and tamper evident lids and handles for easy mobility. Size: 84 litres (670x430x360mm). 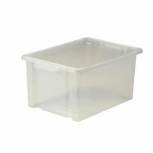 Really Useful Clear 64L Plastic Storage Box 710x440x310mm 64C Pack of 1 Versatile, transparent storage box designed for office use. 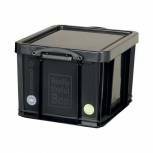 Features include an integral lip to accommodate suspension files, locking and tamper evident lids and handles for easy mobility. Size: 64 litres (670x430x305mm). Wheels not supplied. 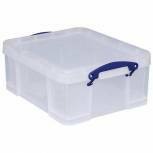 Really Useful Clear 3L Plastic Storage Box 245x180x160mm CD/DVDs 3C Pack of 1 Deluxe document storage strong enough to support an adults weight yet light enough to transport easily. Ideal for CD/DVD storage. Easy contents identification. Stackable. 3 litre capacity. 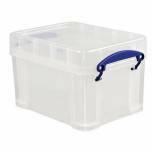 Really Useful Clear 18 Litre Plastic Storage Box W480xD390xH200mm CD/DVDs EBCCD Pack of 1 Really Useful Multidiameter Storage Box. 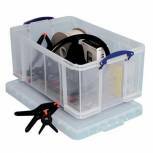 Purposely created archival storage box that are transparent, stackable and rodent resistant. Suitable to hold up to 93 CDs or 44 DVDs. Capacity - 18 litres. Size - W480xD390xH200mm. 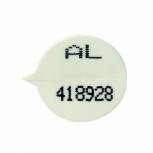 GoSecure White Numbered Security Seals (Pack of 500) WSealNO Pack of 1 Security Seals. Numbered security seals for use with security/postal pouches. Easy to use; just insert by finger pressure and the seal breaks when the zip is opened. Colour - White with Black printing. 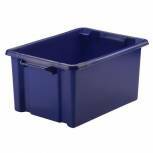 Really Useful Clear 35 litre Plastic Storage Box 35C Pack of 1 Really Useful Office Box. Versatile, transparent storage box designed for office use. Features include an integral lip to accommodate suspension files, locking and tamper evident lids and handles for easy mobility. Size: Euro size (500x390x300mm). 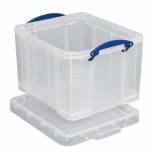 Really Useful Clear 4L Plastic Storage Box 395x255x80mm KING4C Pack of 1 Strong polypropylene stackable storage box with lid and handles, strong enough to take a persons weight. 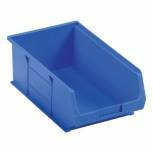 Capacity 4L, external dimensions: 390 x 240 x 80mm. Suitable for storing A4 papers. 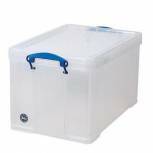 Really Useful Clear 42L Plastic Storage Box 520x440x310mm HBC Pack of 1 Really Useful Office Box. Versatile, transparent storage box designed for office use. Features include an integral lip to accommodate suspension files, locking and tamper evident lids and handles for easy mobility. Size: 42 litres (510x430x300mm). 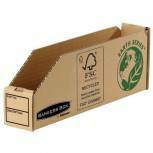 Really Useful Black 35L Recycled Plastic Storage Box 35Black R Pack of 1 Really Useful 35 litre recycled box made from 100% recycled plastic. 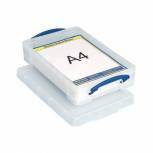 Strong lidded stacking box suitable for storing A4 and foolscap files. 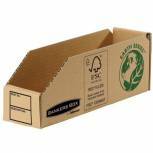 Folds flat for convenient storage when not in use. Dimensions: W480 x D390 x H310mm. 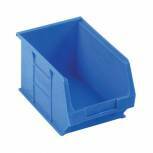 Strata Storemaster Maxi Crate 32L Blue HW046-Blue Pack of 1 Strata Maxi Storemaster Crate 32L. Stackable storage box. Robust. Easy grip handles. Easy to clean. Lid sold separately. W340 x D240 x H470mm. Blue. 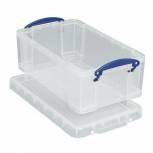 Strata Maxi Storemaster Box 32L Clear HW046-CLEAR Pack of 1 Strata Maxi Storemaster Crate 32L. Stackable storage box. Robust. Easy grip handles. Easy to clean. Lid sold separately. W340 x D240 x H470mm. Clear. 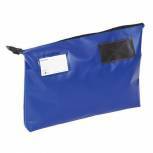 GoSecure Mail Pouch Blue 470x336x76mm GP2B Pack of 1 Heavy duty mail pouch made of durable PVC coated nylon. Ideal for postal and courier use. Up to 10kg capacity. Address window and stamp patch. Can be used with security seals to become tamper evident. W470xD76xH336mm. Blue. 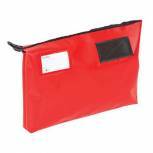 GoSecure Mail Pouch Red 470x336x76mm GP2R Pack of 1 Heavy duty mail pouch made of durable PVC coated nylon. Ideal for postal and courier use. Up to 10kg capacity. Address window and stamp patch. Can be used with security seals to become tamper evident. W470xD76xH336mm. Red. 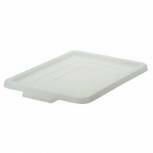 Strata Maxi Storemaster Lid Clear HW045-LID Pack of 1 Strata Maxi Storemaster Lid. To fit the Maxi Storemaster Crate. Clear.